The stress in Europe's interbank system is continuing to build. 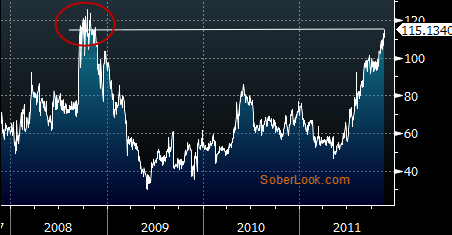 EUR swap spreads are hitting new recent highs this morning, approaching the highs of 2008. The market is anticipating prolonged elevated premiums for term funding. With Spanish bond spreads over Bunds hitting new highs, the banking system that holds a great deal of sovereign paper is feeling the pressure. 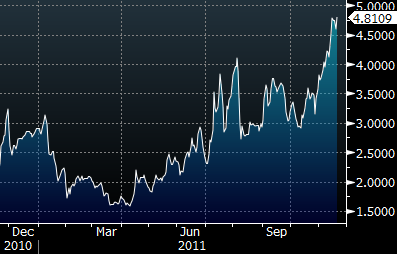 Deutsche Bank 5-year CDS hit 240bp, near the recent highs. If you tried to tune out this weekend, welcome back to reality. Happy Monday.